The federal government told the Senate on Tuesday that it would withdraw the much-opposed Rewaj Act from the National Assembly, assuring merger of the tribal areas with Khyber-Pakhtunkhwa (K-P) within five years. “We are withdrawing the Rewaj Act tabled in the lower house [of parliament] due to the opposition from almost all lawmakers… but I am also hopeful that Fata [Federally-Administered Tribal Areas] will be merged with K-P,” Minister for States and Frontier Regions (Safron) Lt-Gen (retd) Abdul Qadir Baloch said during a discussion by the Senate’s Committee of the Whole on the implementation of a report from the Fata Reforms Committee which was approved by the federal cabinet. 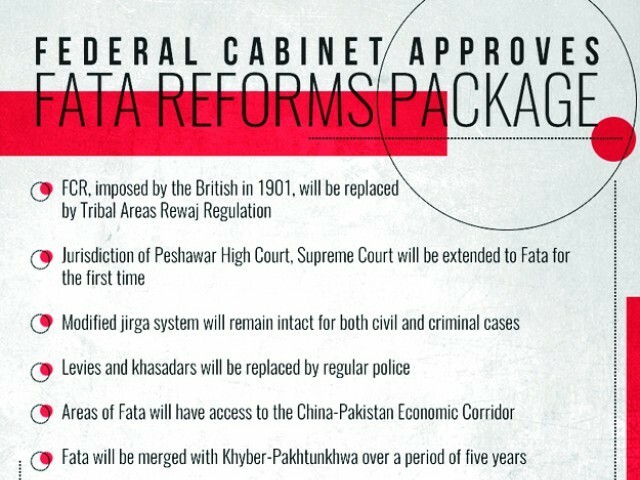 The senators, in turn, urged the government to be honest, transparent and sincere over the implementation of Fata reforms. Assuring the merger of tribal areas with K-P within five years, Baloch said that an immediate merger would have bad consequences due to the law and order situation in some areas. He added that giving executive charge to the local administration was not viable without proper preparation. He also told the senators that the government would soon introduce a bill to extend the jurisdiction of the Supreme Court and Islamabad High Court (IHC) to the tribal areas. The minister was grilled by the senators over the appointment of a chief operating officer (COO) who would work under the K-P governor and oversee all the reforms. They also questioned plans for IHC jurisdiction over Fata. “I have heard that a serving general will be the COO… if that is true then it is the militarisation of Fata which will be disastrous for the people there as the areas have already become a black hole,” said Farahatullah Babar of the Pakistan Peoples Party (PPP). He added that with a COO as serving officer meant that the locus of power would be given to the military, adding that the National Logistics Cell and the Frontier Works Organisation would carry out development without any bidding. To this, the minister assured the senator that all contractors would be able to take part in all the biddings and nobody would be singled out. He also told the senator that a serving general would not be appointed as COO. Babar said that he did not find any logic in extending IHC’s jurisdiction to Fata instead of the PHC’s. Senator Ilyas Bilour also questioned the IHC jurisdiction, saying that tribal people would have to go all the way to the federal capital instead of Peshawar. Even, Senate chairman Raza Rabbani asked the minister about the rationale behind the proposal. In response, Baloch said the government was mulling to enforce IHC’s jurisdiction over the tribal belt as the merger would be spearheaded by the federal government.